Sea King Outboards to 25 HP. 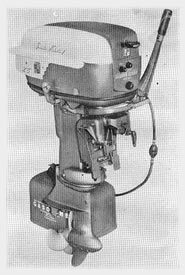 Eight models in four different power ratings will make up the 1957 offerings of Sea King outboard motors. Smallest is the 3 hp. deluxe. The 5 hp. size is available in standard and deluxe models; the 12 hp. in standard, deluxe and electric starting versions; and the 25 hp. in manual and electric starting. Remote fuel tanks are optional on the 5 deluxe and 12 standard models; they are regularly supplied with the other 12 and 25 hp. motors. Remote steering, shift and throttle control are available for all but the standard 5 and the 3. Manufacturer: Montgomery Ward & Co.